4-piece sketch group Lords of Luxury successfully made the transition from podcasts to live performance last year. Now they have honed their stage skills and give us this silly, weird and very shouty offering. The Lords (Paul Verhoeven, Luke Ryan, Dan Debuf and Matt Saracini) attack their hour with infectious manic enthusiasm. Their constant excitement floods the venue and you can’t help but get swept up in it. The atmosphere they create is fantastic. From the moment a snaggletoothed robot introduced the gents, the audience was on board. Sections involving audience participation were handled deftly. There was not a dull moment to be found. The sketches are diverse and often absurd. The Lords whip from the Titanic, to a film production office, to a magic show. The pace does not let up. Though all the sketches hit the mark, by far the highlight of the evening was the dramatic recreation of a sci-fi/action/romance/adventure story, written by Ryan when he was 14. Verhoeven’s turn as a wavy-haired, angular-featured alien beauty is quite possibly the funniest thing I’ve seen this month. The Lords, though all great performers in their own right, are at their best as a team. They look like they’re genuinely having a great time messing around up on stage and it really adds to energy of the sketches. 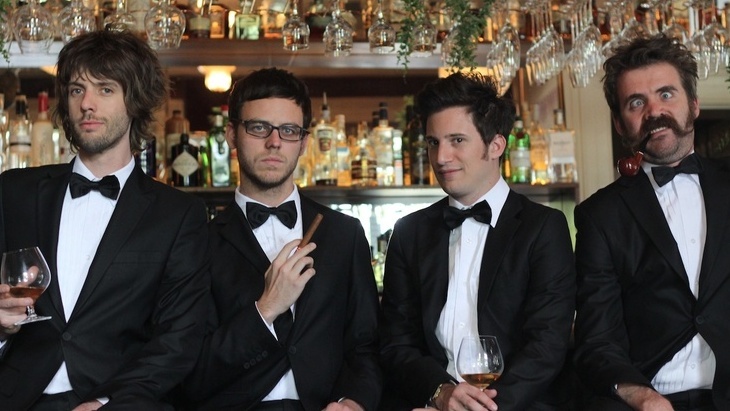 There’s just something so wonderful about seeing grown men in tuxedos being utterly ridiculous. It’s an absolute joy to watch these guys do their thing. I highly recommend Lords of Luxury. The show is downright bizarre and tear-enducingly funny. In what is proving to be an excellent year for sketch comedy, the Lords of Luxury are right up there with the best of them. It’s worth the price of admission to see the alien nightclub scene alone. Consider the rest a hilarious bonus. Lords of Luxury is showing in the Bookroom at Trades Hall until April 20. Next Next post: Abel Seaman : Art! Art! Art!